Cory Popovich, ALP Cycles Racing, wins overall at Tour of the Gila for the Women Cat 3-4-5. Fortunato Ferrara, RA Racing Apparel, takes top position for the Men Cat 1-2. ALP Cycles Racing, Cory Popovich saw herself at top of the podium in the Women Cat 3-4-5 on Sunday. She had the fastest cumulative time from five days of racing with a time of 8:34:24. She was followed by Brook Mickelson of Team Red Rock 1:05 back and Elaine Sheikh of Athletic Mentors, just 1:32 back. However, for the stage 5 top finishers, Chloe Welch of El Grupo Youth Cycling finished in front of Cory Popovich, who received the silver for the stage. The bronze wen to Elaine Sheikh. Finishing 5 days of racing with over 13 hours of competitive racing, the leader of Men Cat 1-2 in the GC standing was Fortunato Ferrara, of RA Racing Apparel. Gabriel Rojas, a junior, finished second, only 1:49 back of the lead from 5 stages. Manuel Salas Chavez of Crazy Cat Cyclery was third in the overall standings, 2:05 off the lead. For the Stage 5 podium, Sean Quinn, a junior of LUX / Sideshow p/b Specialized was first, with Lionel Mawditt of InForm MAKE in second, and Manuel Salas Chavez of Crazy Cat Cyclery just :05 behind. Fourth, fifth, and six were all juniors just seconds behind. Ben Wright (4th :08 behind) LUX / Sideshow, Gabriel R ojas (5th :08 behind), and Andrew Vollmer (6th :12 behind) LUX / Sideshow. 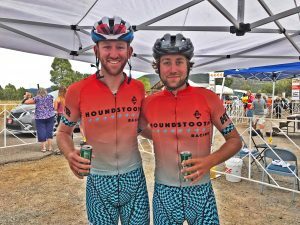 From the Men Cat 3 division, Lux / Sideshow had a strong showing in the overall GC and in Stage 5 with 1-2 finishes in Stage 5 by Jared Scott and Matthew Riccitello. Zachary Morrison, of Athlete Octane rounded out the podium for the stage just 2:10 back and Dillion Long, El Grupo Youth Cycling, at 2:14 back, coming in 4th for the Gila Monster race. The 1-2 finishers of stage 5, swapped places in the overall GC with Matthew Riccitello receiving top honors followed by teammate Jared Scott for the second overall and Aidan McNeil of Team Swift for third overall. 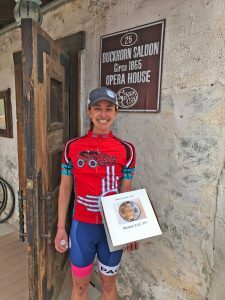 Capturing moments of reflection from participants, Justin Diamond from Boulder, Colorado, HTR, who finished 8th in Stage 5 and 10th in the GC standings shared, “The Tour of the Gila is a remarkable race. The event and location has a similar feel to Boulder, but a little more remote is some ways. It is the small-town charm that he will remember most. Everyone loves the atmosphere. The hospitality is fantastic” he said. 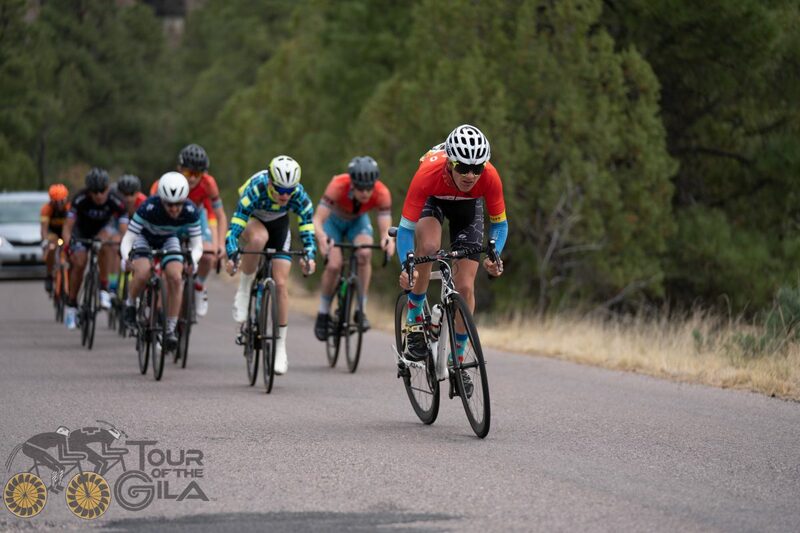 In the final stage of Tour of the Gila, in the Men Cat 4-5 division, Travis Lechner rose to victor, followed by Quinn Abfalterer second and Jonathan Mclaren, of Bicycle Ranch Racing Tucson. This translated over into GC placing of Travis Lechner coming in first with a 4:22 lead over Tyler Lock, of DWC Trailhouse Village Bicycling, and Jonathan Mclaren coming in third overall. Notable junior rider placements for this division saw 1st going to Aidan Rhodes (8th in Cat 4-5), followed by silver to Ethan Sotelo (11th in Cat 4-5) of El Grupo Youth Cycling, and bronze to Issac Adams of El Grupo Youth Cycling (14th in Cat 4-5). 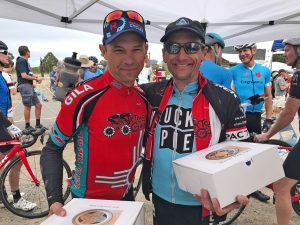 Stage 5 for Master Men A raced 68.9 miles on Sunday with Raik Huster, of Sonic Boom Racing Team p/b Lucky Pie, taking the top podium placement for the challenging Gila Monster stage. Just 3 seconds behind was Jonathan Baker of Touchstone Racing, followed by Jonathan Cavner, of Sonic Boom Racing Team. When the GC standings were calculated, the winner the overall for this year’s running of the Tour of the Gila for the Master Men A was Jonathan Cavner, followed by Raik Huster, giving Sonic Boom the 1-2 finish overall. Jeromy Cottell, of Touchstone Racing was third. Catching up with Raik Huster and Jonathan Cavner after the race, Jonathan shared, “The community here is amazing. Silver City is a great place to come and race, as there is no place like it anywhere. 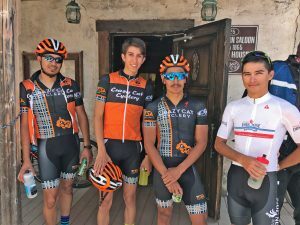 The support from all the locals is second to none.” Raik shared, “The Tour of the Gila is very well organized and so professional.” Both riders expressed their gratitude for such a great race and all the volunteers and community support that made it possible. 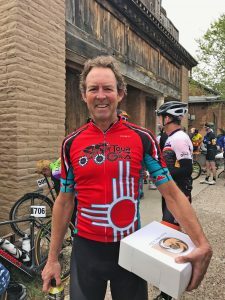 James Newsom of Team Elevate Racing, a second-year participant, who rode in the Master Men A division, shared his thoughts on the Gila. “The Tour of the Gila is such a hard race. In this division, there is not a whole lot of strategy. It comes down to whoever is the strongest. 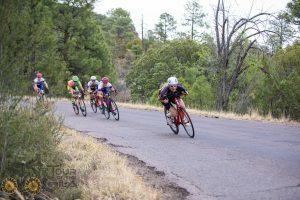 The Tour of the Gila is truly the hardest race you can do as a 55+, but very worth it.” James Newsom was 13th overall in the GC for Master Men A and first in the 55+ category. James Newsom, Fort Worth, Tx, Team Elevate Racing. In the Master Men B division, rising to the top in the GC after stage 5 was Gerry Clapper of Fleming Wealth Strategies, followed by Dermot Kealey from Great Britton of Finchley Racing Team, and third was Omar Dickenson of Sonic Boom Racing. The stage win saw Gerry Clapper still in first, but second went to Richard Horn of Aggress, followed by Dermot Kealey, third. The peloton was tight at the finish with notable times posted by Michael Kolczak of Lee’s Cyclery-Trek Bikes 3:05 back, Omar Dickenson of Sonic Boom Racing 3:09 back, Nick Gillock of Velo Club La Grange, Richard Mull of Big Orange Cycling, and Andrew Scott of Sabino Cycles, all 3:13 back on the 69.9 mile ride through the Gila. 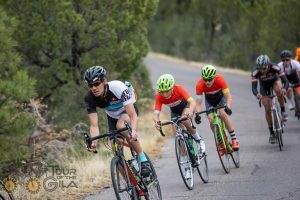 Special thanks to all of the amateurs who came and raced this year at Tour of the Gila.